The Bengal Presidency (1757–1912), later reorganized as the Bengal Province (1912–1947), was once the largest subdivision (presidency) of British India, with its seat in Calcutta (now Kolkata). It was primarily centred in the Bengal region. At its territorial peak in the 19th century, the presidency extended from the present-day Khyber Pakhtunkhwa province of Pakistan in the west to Burma, Singapore and Penang in the east. The Governor of Bengal was concurrently the Viceroy of India for many years. Most of the presidency's territories were eventually incorporated into other British Indian provinces and crown colonies. In 1905, Bengal proper was partitioned, with Eastern Bengal and Assam headquartered in Dacca and Shillong (summer capital). British India was reorganised in 1912 and the presidency was reunited into a single Bengali-speaking province. The Partition of British India in 1947 resulted in Bengal's division on religious grounds, between the Indian state of West Bengal and the Pakistanian province of East Bengal, which first became East Pakistan in 1955 under Pakistanian rule and finally the nation of Bangladesh in 1971. Under Warren Hastings (British Governorships 1772–1785) the consolidation of British imperial rule over Bengal was solidified, with the conversion of a trade area into an occupied territory under a military-civil government, while the formation of a regularised system of legislation was brought in under John Shore. Acting through Lord Cornwallis, then Governor-General, he ascertained and defined the rights of the landholders over the soil. These landholders under the previous system had started, for the most part, as collectors of the revenues, and gradually acquired certain prescriptive rights as quasi-proprietors of the estates entrusted to them by the government. 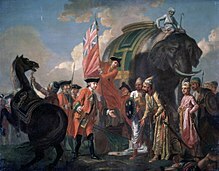 In 1793 Lord Cornwallis declared their rights perpetual, and gave over the land of Bengal to the previous quasi-proprietors or zamindars, on condition of the payment of a fixed land tax. This piece of legislation is known as the Permanent Settlement of the Land Revenue. It was designed to "introduce" ideas of property rights to India, and stimulate a market in land. The former aim misunderstood the nature of landholding in India, and the latter was an abject failure. So unsuccessful was the Permanent Settlement that it was not introduced in the North-Western Provinces (taken from the Marathas during the campaigns of Lord Lake and Arthur Wellesley) after 1831, in Punjab after its conquest in 1849, or in Oudh which was annexed in 1856. These regions were nominally part of the Bengal Presidency, but remained administratively distinct. The area of the Presidency under direct administration was sometimes referred to as Lower Bengal to distinguish it from the Presidency as a whole. Officially Punjab, Agra and Allahabad had Lieutenant-Governors subject to the authority of the Governor of Bengal in Calcutta, but in practice they were more or less independent. The only all-Presidency institutions which remained were the Bengal Army and the Civil Service. The Bengal Army was finally amalgamated into the new British-Indian Army in 1904–5, after a lengthy struggle over its reform between Lord Kitchener, the Commander-in-Chief, and Lord Curzon, the Viceroy. A jute mill in Narayanganj, 1906. East Bengal accounted for 80% of the world's jute supply. British India's Montagu-Chelmsford Reforms of 1919, enacted in 1921, expanded the Bengal Legislative Council to 140 members to include more elected Indian members. The reforms also introduced the principle of dyarchy, whereby certain responsibilities such as agriculture, health, education, and local government, were transferred to elected ministers. However, the important portfolios like finance, police and irrigation were reserved with members of the Governor's Executive Council. Some of the prominent ministers were Surendranath Banerjee (Local Self-government and Public Health 1921-1923), Sir Provash Chunder Mitter (Education 1921–1924, Local Self-government, Public Health, Agriculture and Public Works 1927–1928), Nawab Saiyid Nawab Ali Chaudhuri (Agriculture and Public Works) and A. K. Fazlul Huq (Education 1924). Bhupendra Nath Bose and Sir Abdur Rahim were Executive Members in the Governor's Council. ^ "Bast and Other Plant Fibres". ^ Ilbert, Sir Courtenay Peregrine (1907). "Appendix II: Constitution of the Legislative Councils under the Regulations of November 1909", in The Government of India. Clarendon Press. pp. 431. ^ Ilbert, Sir Courtenay Peregrine (1907). "Appendix II: Constitution of the Legislative Councils under the Regulations of November 1909", in The Government of India. Clarendon Press. pp. 432–5. ^ Ilbert, Sir Courtenay Peregrine (1922). The Government of India, Third Edition, revised and updated. Clarendon Press. pp. 117–118. ^ Ilbert, Sir Courtenay Peregrine (1922). The Government of India, Third Edition, revised and updated. Clarendon Press. p. 129. ^ Jalal, Ayesha (1994). The Sole Spokesman: Jinnah, the Muslim League and the Demand for Pakistan. Cambridge University Press. pp. 26–27. ISBN 978-0-521-45850-4. ^ Sanaullah, Muhammad (1995). A.K. Fazlul Huq: Portrait of a Leader. Homeland Press and Publications. p. 104. ISBN 9789848171004. ^ Nalanda Year-book & Who's who in India. 1946. This article incorporates text from a publication now in the public domain: Chisholm, Hugh, ed. (1911). "Bengal" . Encyclopædia Britannica (11th ed.). Cambridge University Press.